Techno logic : for string quartet / by Matthew Hindson. Instrumentation: 2 violins, viola, cello (CD required for Movt II (available from composer on request)). Amplification highly desirable.Requires the use of either a looping sampler or a pre-recorded CD. Techno logic was written in 1997 as a commission from the Elektra String Quartet, and premiered by them in October of that year. As the title suggests, a good deal of the music was written using techniques found in techno music, including repetition, parallel triadic harmony, block-line structures and predominantly fast tempos. The structure of the piece as a whole is reminiscent of Peter Sculthorpe's String Quartet No. 8. The outer movements contain slower yet intense material with the cello imitating the sound of the didjeridu. The 2nd and 4th movements most obviously use features of techno music as described above. The middle movement takes the form of a bizarre ballet mechanique, wherein the two violins and cello play unflinching regular single notes and motives above an ever-present viola figure. 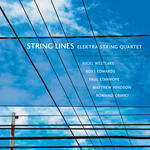 Commissioned by Elektra String Quartet with funds provided by Australia Council. Movements from this work may be performed separately or in different combinations: for example, the first, third and fifth movements would form a set called technologic 135. Score: Techno logic : for string quartet / by Matthew Hindson. Score: Micros : eleven string quartets from Australia and Norway. Score: Techno logic 2 : for string quartet / Matthew Hindson. Parts: Techno logic 2 : for string quartet / Matthew Hindson.